The Live Dashboard gives you instant access to the most important information that pertains to the health of all your phone numbers. If there is a problem with one or more of your numbers this page will guide you to the necessary pages that will give you very specific details on what number failed, when it failed and let you listen to the recordings that Tiksoo captured during the failed calls. The amount of call credits you have remaining. The amount of groups and phone numbers that are actively being monitored. If any numbers are currently in an alarm status. The amount of failures you have had in the past 24 hours. How many calls have been made in total as well as how many failures and Timeouts that have occurred. 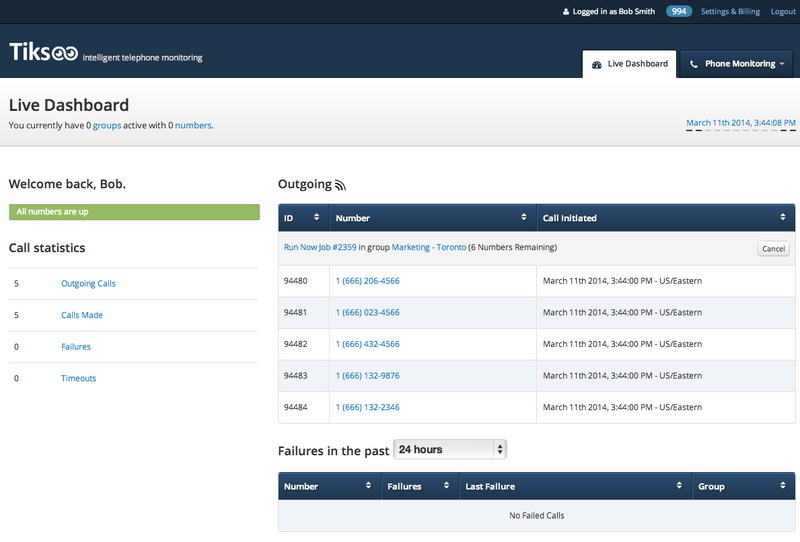 From the Live Dashboard you can see the detailed call history of any phone number that has failed by simply clicking on the phone number listed in the section labelled “Failures in the past 24 hours”. This will show you the complete call history of this phone number and you will be able to listen to all the recordings of this number that have occurred over the past 7 days. A list of all the previous calls complete with their start and stop times, the status of the call (Success or Failed) and the ability to click the play button to listen to the recording of each call. NOTE: The actual call records are kept indefinitely, however the audio recordings are only kept for 7 days. 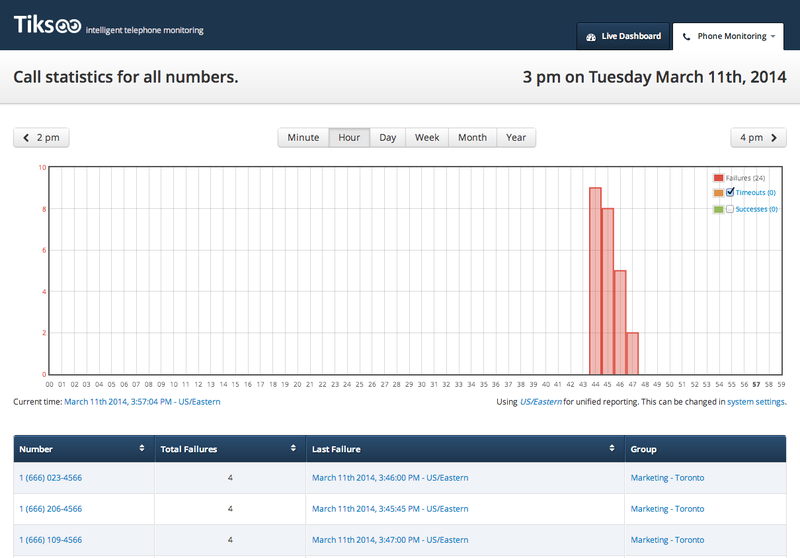 From the Call history page you can click on the “Call Statistics” button at the top right corner of the page and it will provide you with a chart to show the amount of failures for the last Minute, Hour, Day, Week, Month or Year. In the example below you can see the failures as they occurred throughout a single day.